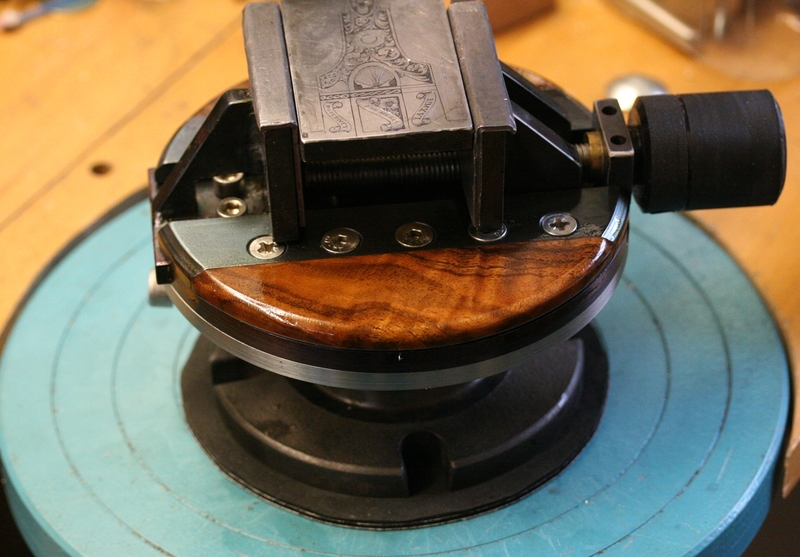 Here is a new project;- I need a very low profile engraving vice for my portable kit, and it would probably make life more comfortable in the workshop – the height of my engraver’s block/ball, plus the working distance of the microscope plus the height from objective to eyepiece is uncomfortably close to the distance between my lap and my eye when sitting. So I have a project to build a thin vice using only 8mm x 50 mm bright steel bar, an angle grinder, a pedestal drill and some M6 screws and an M6 tap plus an M10 tap and an old M10 bolt for the fundamentals, plus a very small amount of TIG welding on the jaws (could be screwed). I have cheated in that I put the half finished vice platform in the lathe to get it shaped – cosmetic only – I could have done it with the angle grinder given more time and patience than I had – plus I ran out of cutting disks for the grinder!